WBJEE or West Bengal Joint Entrance Examination opens up opportunities to study in premier engineering institutes in West Bengal including Jadavpur University, Heritage College, Kalyani College of Engineering, and Institute of Engineering and Management for all of it’s candidates. To get admissions into any of the above institute is tough and a rigorous procedure has to be followed for the same. Every document concerning the candidature has to be preserved carefully to produce when the registration begins including the admit cards and the rank cards. 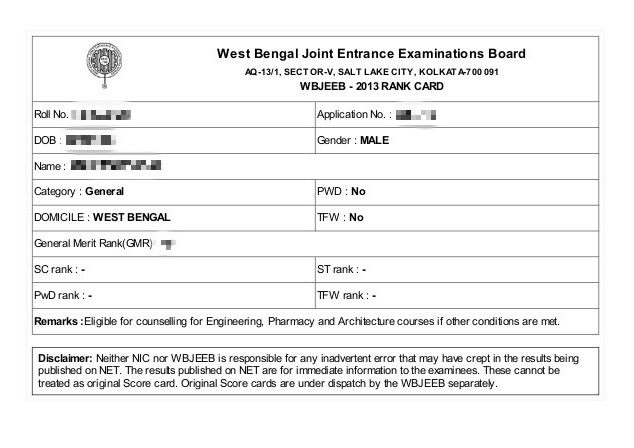 Below is a picture of a sample WBJEE Rank Card issued by West Bengal Joint Entrance Examinations Board for a candidate after he appeared for the exam in 2013. This is the online copy of the WBJEE rank card. A hard copy is also sent by the WBJEE board which is usually delivered within a few days of the exam day. The rank card contains the candidate’s personal information including Name, Date of Birth, Gender, Roll No., Application No., and Category. The candidate has to produce the offline version received by post, or the online version while undergoing registrations for his/her choice of college. Generally, the most preferred choice for WBJEE candidates is Jadavpur University. Do not forget to carry your WBJEE admit cards with you when you go for registrations. If you are still preparing for WBJEE or need help with application forms, you could visit us at TopprBytes. Toppr wishes you all the best for your admissions!